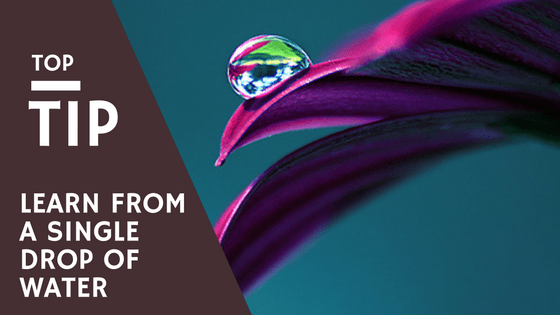 The top tip you can learn for your business comes from a single drop of water! Have you ever been caving? I have and get totally transfixed every time too think that something as gentle as water can create such large caverns under the ground. Our tour guide when we went to Ingleborough Cave, Skipton explained to us (me and my eldest daughter) how it can take thousands of years for the water to slowly but persistently work its way through the cracks in the rock levels before the pressure causes the layers to break up enough to create the caverns people explore through today. It also takes thousands of years for the drops of water and calcium to create the stalactites and stalagmites formations that add to the views inside these caverns. The beauty left behind can be breath taking and humbling at the same time, to see something so basic yet beautifully made by nature. We were lucky enough to be in a cave with so much documented history and could see exactly how the cave had changed in just 100 years, which was not much even though water still flows through and occasionally floods. You are probably wondering why I am talking about caving and what it has to do with business but you will see. When the guide explained the time it takes for a small drop of water to wiggle its way down in order for more water to follow and great this amazing caverns it got me thinking. Many people are trying to make millions in weeks and expect it all to just happen instantly when they click the start button, however it is not true. Just like that little drop of water it takes time for small actions in your business to build in to bigger and better things. Those minutes you sit putting together posts for social media and blogs, those graphics you created and stressed over just to advertise a new product, even all those emails you sent time after time with no replies. They are those drops of water slowly edging their way in to the cracks of the business world. Right now they seem small and insignificant to your business, mostly when they seem to bring very little return for the time and effort put in. Nevertheless, each tiny step you take in your business is pushing your business one small drop at a time to the biggest cavern of success you could ever imagine. ‘Many businesses are known to fail within the first 3 years’ and not always because they are not a viable business but because the owners suffer burnout over the small steps. So do not let those small steps burn out your passion for your business. Do not give up those little steps, take even more of them and celebrate each time you come across a large crack in the ‘limestone’ that is the fight to success. Celebrating each small step makes the step even more significant and therefore can increase your motivation to continue taking those small steps. Things will take time but they will happen.